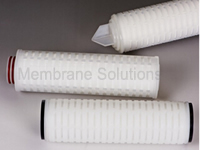 MS’NanoPure PES cartridge filters are designed for DI water and applications where weak acids or bases are used. A layer of pleated hydrophilic Polyethersulfone membrane provided a higher flow rate and particle retention. Benefit form high asymmetric structure, NanoPure cartridge filters ensure a longer lifetime and fewer changeouts, lower pressure drops.